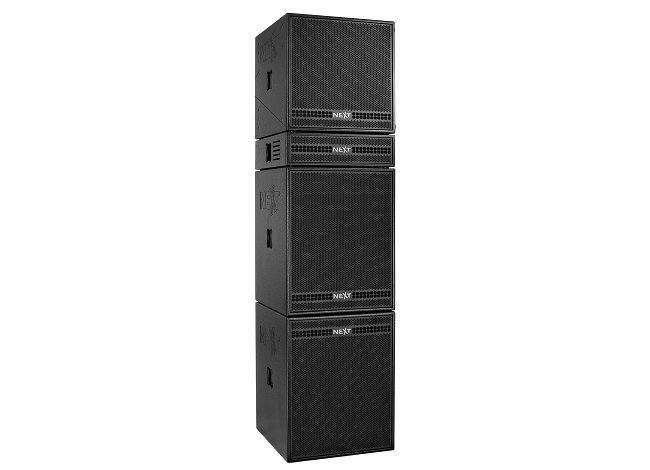 The new NEXT PXH95 belongs to the PX system, a system that can offer high SPLs, reliability, an aesthetic design and high sound fidelity throughout the venue being an ideal system as a portable solution for small concerts as well as used as side fill or DJ monitoring. When used alone, the new PXH95 can be used in a variety of installation projects, including sports facilities, performance spaces, auditoriums, or worship facilities. This new element was engineered to be a powerful medium/longthrow mid/high-frequency cabinet in a coaxial configuration, covering the frequency range from 150 Hz to 19 kHz creating a precise coverage pattern of 90°H x 50°V over a frequency range from 400 Hz–17kHz, ensuring equal sound within the coverage area. To obtain the highest possible on-axis sound pressure levels over long distances, the PXH95 mid/high unit is entirely horn-loaded creating an additional sensitivity and improved pattern control. The HF range from 1.150 kHz upwards is reproduced by a Neodymium 1.4” driver with a 3” voice coil and a Constant Q horn, whilst coverage in the mid-range from 150 Hz to 1.25 kHz is provided by a low power compression 12” driver loaded by a midrange horn. Wider coverage can be achieved using multiple tops, laterally stacked or flown. The PXH95 cabinet must be rotated (90°) to maintain at minimum the comb-filter effects. A Tilt Unit (available as an option) permits the cabinet to be angled in 5° increments up to a maximum of 15°; as a result, the upper cabinet can be aimed directly at the audience area even when the system is ground stacked. Optional flying hardware enable the cabinet to be flown. The cabinet is fitted with M8 threaded suspension points, supporting a wide variety of installation approaches.